This year is going by way too fast! I can’t believe it’s springtime and you know what that means…time for spring cleaning!! I don’t know about you but I love a good spring cleaning. There is just something cathartic about cleaning out drawers and closets and getting rid of the junk. 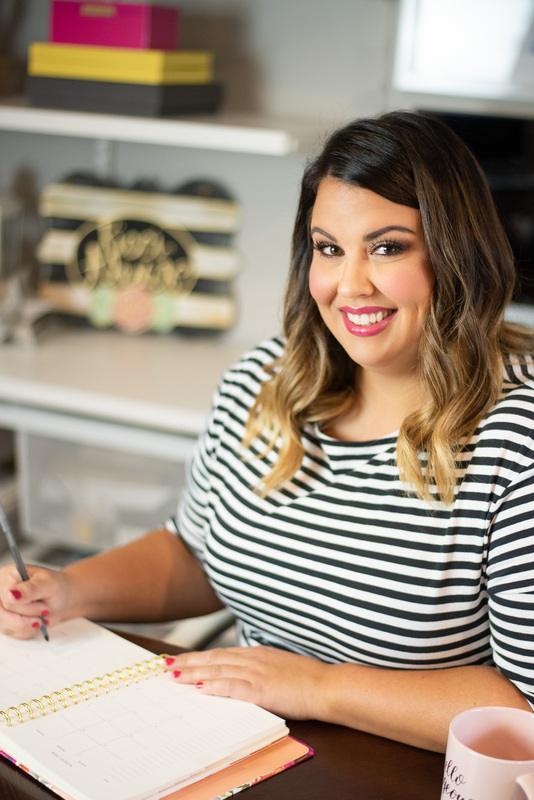 I also love cleaning out all the nooks and crannies and making everything in my home sparkle. I secretly love spring cleaning but don’t tell anyone that!! I have been in my home for almost five years and have tried a variety of different cleaning methods but the only thing that really makes them shine is Pledge® Orange Clean Furniture Spray. I know most people think of Pledge® Orange Clean Furniture Spray as a wood cleaner but it can actually be used on a variety of surfaces including stainless steel!! The day I discovered this I swear the heavens opened up and angels started singing. Always go with the grain. Like wood, stainless steel has a grain and you can see which way yours goes by looking for the striations on the surface of the appliance. All of mine happen to go vertically so that makes cleaning everything pretty easy! Wipe it down Charlie Brown. It’s important to first wipe your appliances down with a dry cloth first to remove anything stuck on (like food from sticky fingers). Polish to perfection. When you are finished cleaning you can wipe your surfaces down again with a dry cloth to get rid of any drying/still marks still left on the surface and “polish” your appliance. However, if you are using Pledge® to clean with you can usually skip this step. 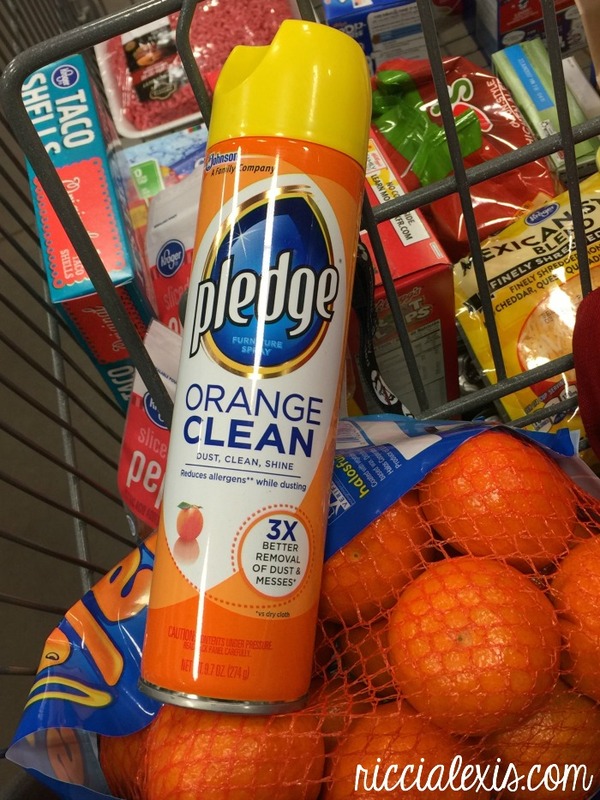 Pledge® Orange Clean Furniture Spray can be used for furniture cleaning all around the house to quickly clean, condition and protect – all while leaving behind the classic, fresh Pledge® scent. It also features Allergen Trappers® to remove dust and up to 90% of the allergens found in dust. In addition to wood and stainless steel Pledge® Orange Clean Spray can be used to dust, shine and protect a variety of household surfaces including laminate, leather, marble, granite and plastic. 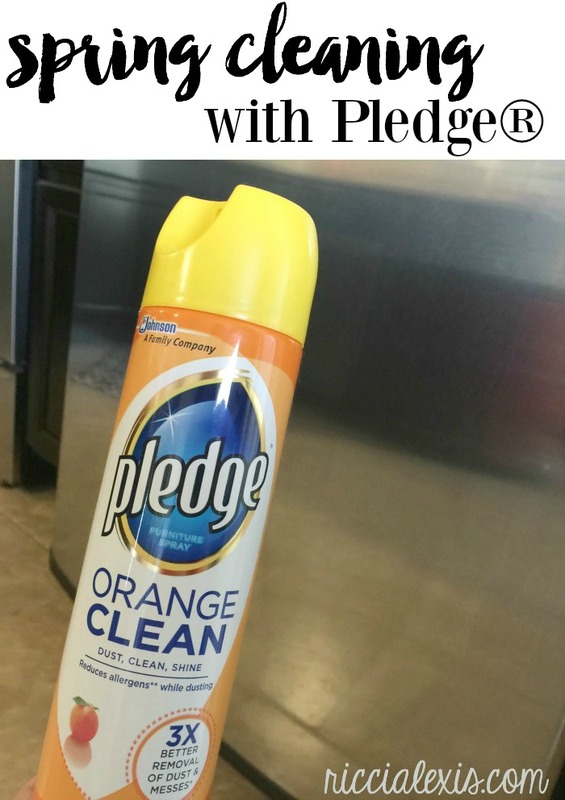 Pledge® Orange Clean Furniture Spray also comes in the original Lemon scent and works the exact same as the orange, I just prefer the orange scent these days for some reason. There is also a Pledge® Multi Surface Everyday Cleaner with Glade® Rainshower® and Pledge® Lemon Wipes to cover the rest of your household cleaning needs! I found my Pledge® at my local Kroger and you can pick yours up there as well! I love that Kroger has become my one stop shop for all my household needs! Want to learn more about the ways Pledge® can help you with your spring cleaning? Check out their Facebook page for more useful tips and tricks! I use Pledge all the time. My house gets super dusty because of our forced hot air heat. Pledge is my favorite dusting tool. It makes getting the dust off of my wood so easy, and it makes it so shiny! I love Pledge. I love the smell of oranges! The two together perfect! I love Pledge. I had no idea they made an orange scent! I will have to pick some up. I like the regular scent but orange would be a nice change. I dislike dusting and honestly I would prefer to give the task to my daughters! We use pledge all the time. I love the one with extra moisturizing especially because it’s so dry here. Cleans like a dream. I had no idea pledge had an orange scent. It sounds divine. The lemon scent is nice, but there is something about orange that feels more warm. I had no idea you could use this on leather and stainless steel! I only assumed it was meant for wood. I’ll have to try. I love Pledge and I’ve been using it for years. I haven’t tried the Orange scent, though. I do a lot of my spring cleaning with Pledge too. I may have to try the furniture spray since we just brought home a new kitten. I’ve been using pledge for years, they have the best scents! Although, I have to admit, I had no idea it would work perfectly with stainless steel. Thanks for the tips! I really like Pledge. It never leaves streaks on my furniture! And I want to find this orange scented one now! That sounds really great! Thanks for the information. I really need that. I love Pledge and their orange oil. We use it on our kitchen table. It always smells so good! I love using Pledge. They have some amazing products that work well too. I think the orange one would smell amazing. Amazing product, nice post . I love to use Pledge Orange. It is a a fantastic scent and works great to clean. 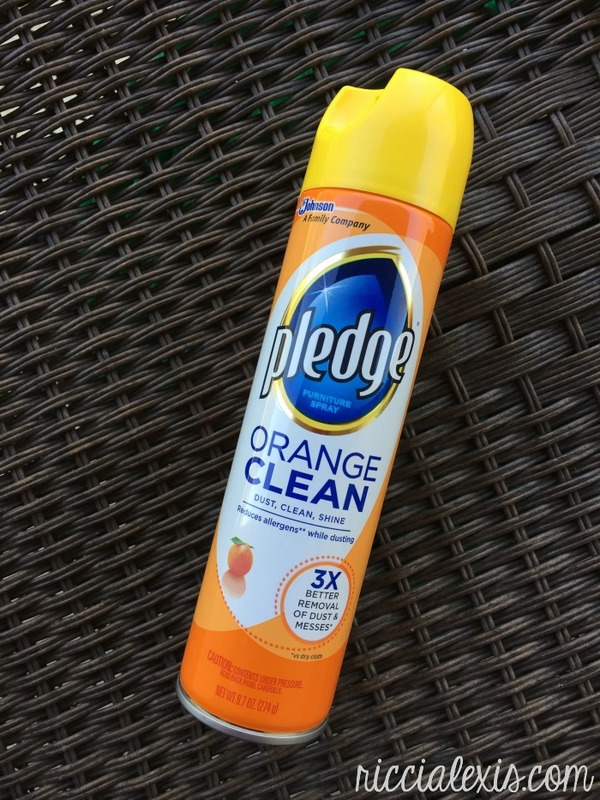 As long as I can remember my mom has used Pledge on everything in our home, I use it as well now when I need to do my regular cleaning or spring cleaning. I love the orange scent of this Pledge! We live across from a big field and that can blow a lot of dust into my house on windy days so Pledge is a must! Wow pledges been around I guess since I was a kid in a long long time. I remember my mom would always use pledge to clean our house when I was a child and it smelled so good. Pledge is the gold standard and has a great reputation and brand. Good tips! Wipe it down, Charlie Brown! Pledge has more uses (and scents) than I realized. I really need to get cleaning this spring, thanks for the inspiration! We don’t do any cleaning without pledge. It’s one of the best out there in terms of home cleaning! 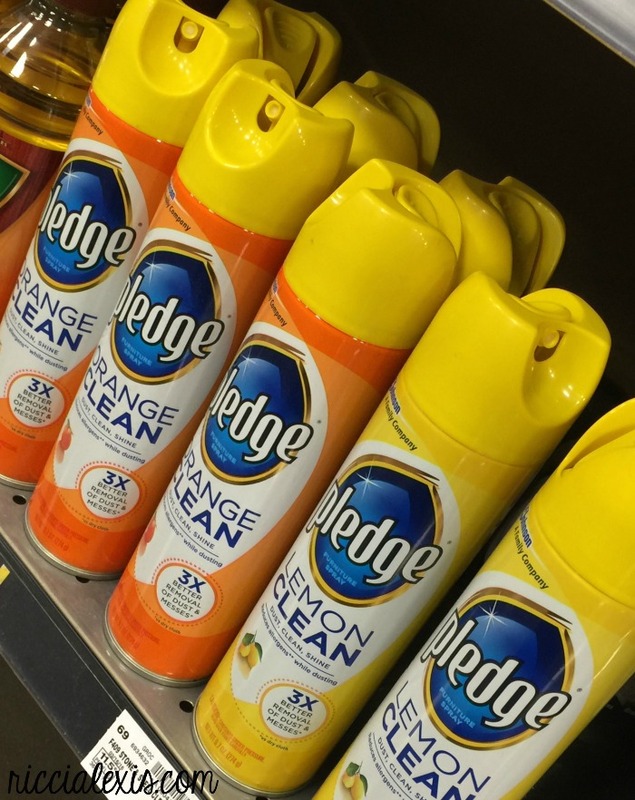 I love cleaning with pledge, it is the only buy that I buy all the time. It smells and clean good! I love the smell of Pledge! Is that weird? We still need to get started on our spring cleaning! That’s a good tip to go with the grain. Sometimes we get in a hurry and forget that, swiping back and forth at will. I love Pledge! We just finished a bottle of it and is listed on my next grocery shopping. It makes the furniture shiny. I love cleaning with pledge, it’s great on all of the hardwood in my home. We have hardwood flooring through out and LOTS of real wood woodworking. I love Pledge! They’re great and I’ve always used them!